The Hennessey name has long been associated with making cars — and trucks — go faster. Throughout its history, the American tuner has upped the performance on an array of vehicles ranging from sports cars to SUVs. 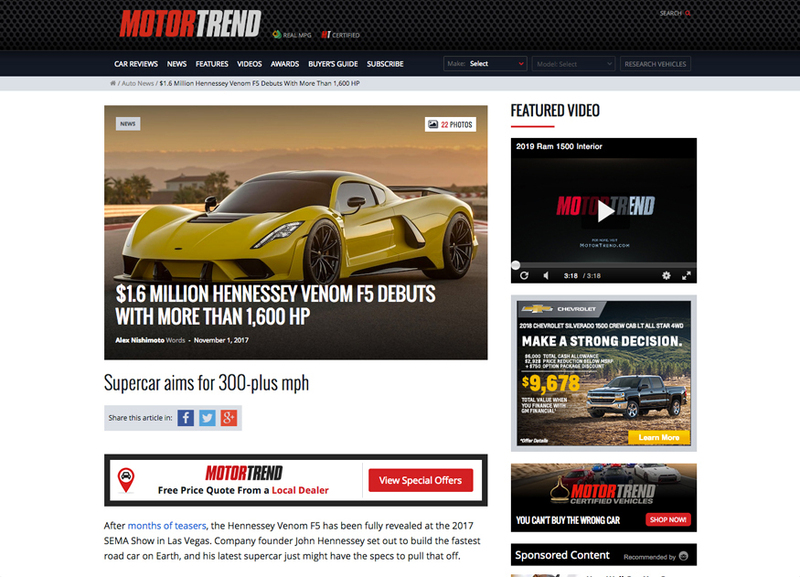 A few years ago, Hennessey decided to build a new vehicle from the ground up — the result was the Venom GT. Powered by a 1244-horsepower 7.0-liter V8 engine, the Venom GT churns out stunning performance figures including a top speed slightly over 270 mph. 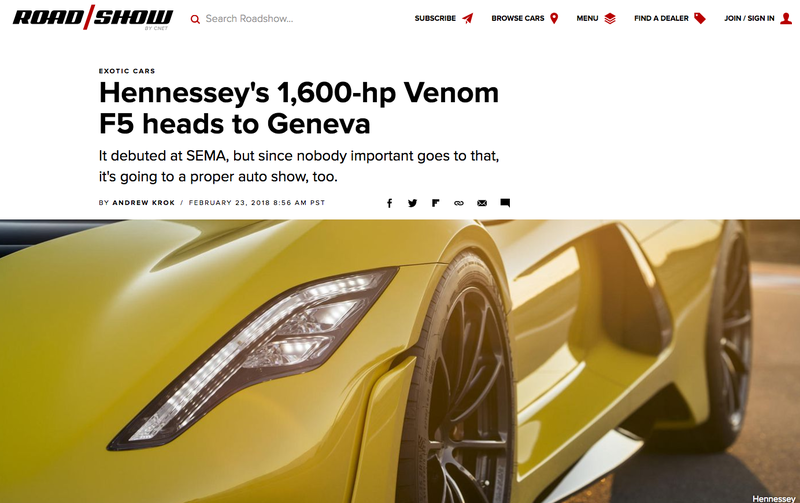 Although this seems like a performance number most tuners could not top, in Geneva Hennessey showed a new vehicle designed to do just that. Continue reading MSN’s article on their website. Good news, people of the Internet. 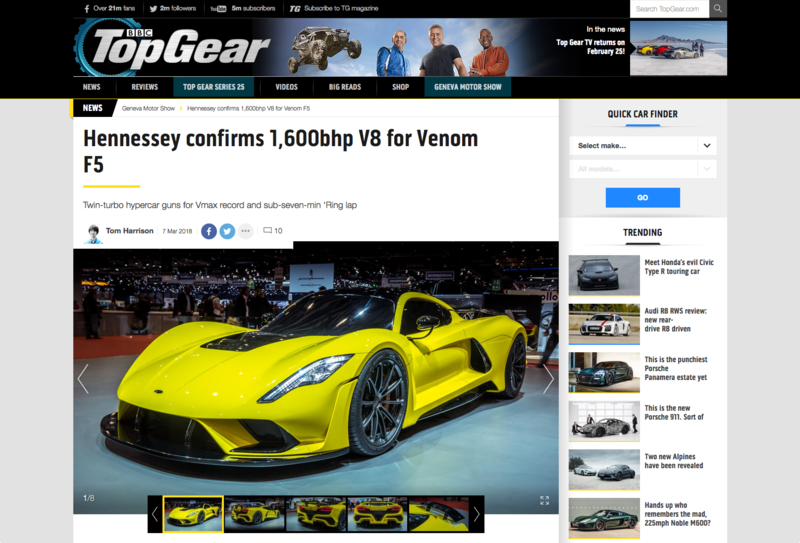 John Hennessey has confirmed to TopGear.com that his upcoming Venom F5 hypercar will have a “completely bespoke, 8.0-litre twin-turbo V8” with no less than 1,600bhp. Continue reading Top Gear’s article on their website. 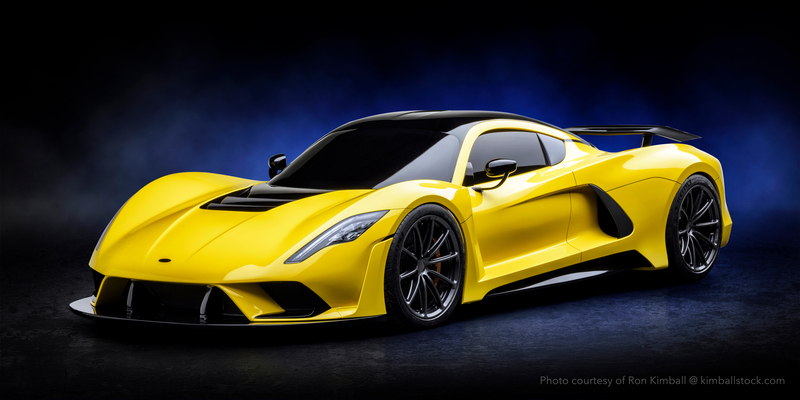 The 1,600-horsepower Venom F5 is headed to the 2018 Geneva Motor Show in March, CarBuzz reports. While it’s certainly an impressive vehicle based on its spec sheet, nobody’s seen the thing put down what it promises yet. Continue reading CNET’s article on their website. FOUNDER & CEO John Hennessey will be there, too. With a promised top speed of more than 300 miles per hour, the Hennessey Venom F5 sounds like the American hypercar horsepower fans have been waiting for. Unfortunately, while the coupe may have been shown in full at SEMA this past year, it wasn’t completely ready for road use. Here’s hoping that Hennessey will have a working model when doors open to the Geneva Motor Show in just a few weeks. Continue reading the Motor 1 article here. 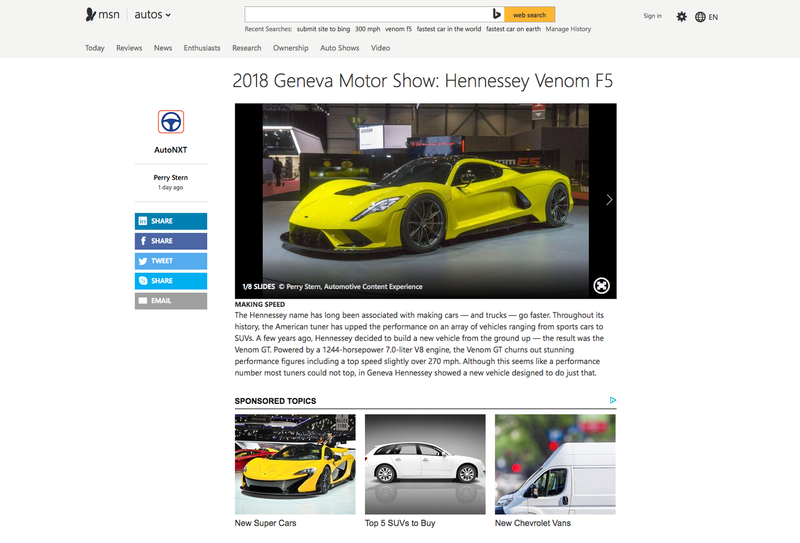 This year’s Geneva Motor Show is going to be full of power, especially since John Hennessey announced that they will be attending the event with their Venom F5 hypercar. 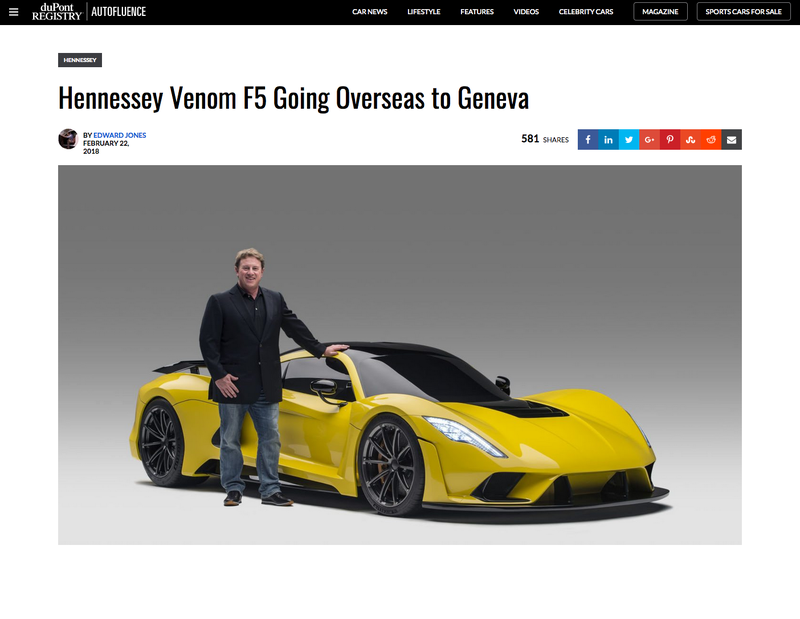 Along with the Venom F5 making its way overseas, our friend John Hennessey will be in attendance as well. That means a car from the United States of America will be one of the fastest and most impressive cars in attendance. Continue reading the article on duPont’s website. Hennessey Special Vehicles has revealed what aims to be the first 300 mph street legal production car. The Venom F5 was designed in house by the Texas-based company and features a carbon fiber body and mid-engine chassis, rear-wheel-drive and a twin-turbocharged 7.4-liter V8 rated at 1,600 hp and 1,300 lb-ft of torque. 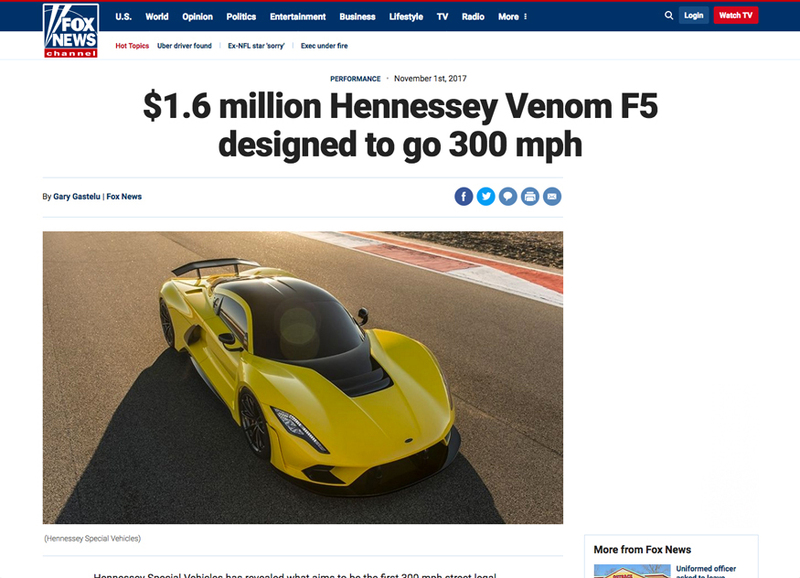 Read more the Hennessey Venom F5 article on Fox News. Hitting 300mph in a road car. What are the challenges? Is it even achievable? The current fastest speed in a road car is 270.49mph. It’s held by a Hennessey Venom GT, only 2.63mph above the Bugatti Veyron Super Sport, and achieved in only one direction. Read more on Top Gear’s site. 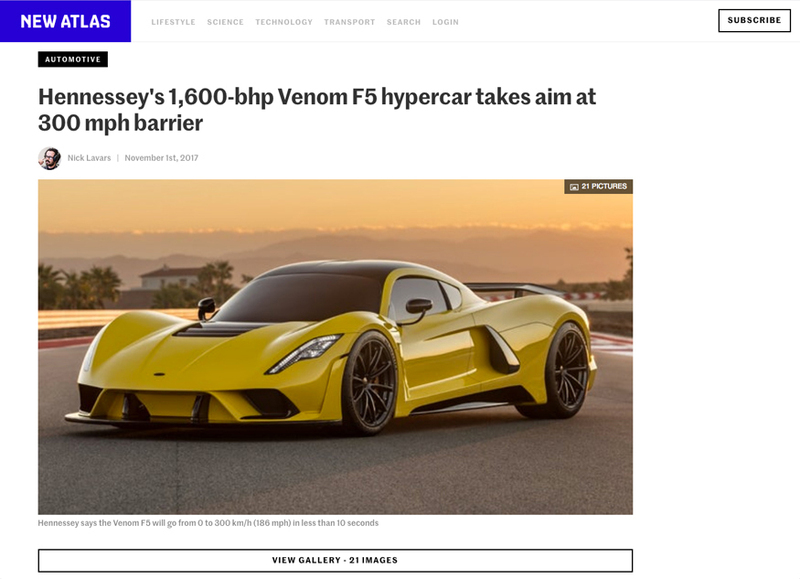 Hennessey Performance, the Texas tuning house whipped the covers off its highly anticipated hypercar, the Hennessey Venom F5 at SEMA in Las Vegas this week, revealing a mean-looking, carbon fiber body befitting the fastest production car in the world. Read more in the latest New Atlas article. 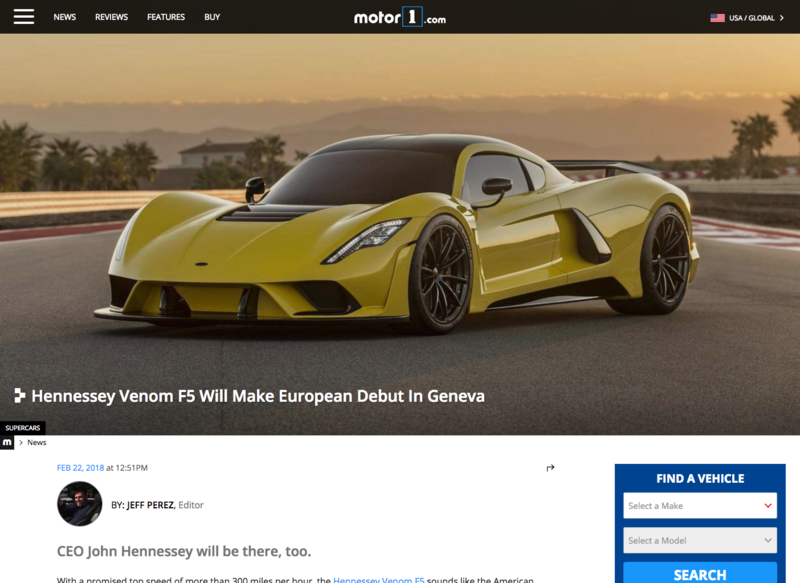 After months of teasers, the Hennessey Venom F5 has been fully revealed at the 2017 SEMA Show in Las Vegas. Company founder John Hennessey set out to build the fastest road car on Earth, and his latest supercar just might have the specs to pull that off. Read the rest of the article on Motor Trend.